Gandhi, Jennifer 2019. The Institutional Roots of Democratic Backsliding. The Journal of Politics, Vol. 81, Issue. 1, p. e11. Buttorff, Gail J. 2019. Authoritarian Elections and Opposition Groups in the Arab World. p. 1. Lu, Fengming and Ma, Xiao 2018. Is Any Publicity Good Publicity? Media Coverage, Party Institutions, and Authoritarian Power-Sharing. Political Communication, p. 1. Croissant, Aurel and Lorenz, Philip 2018. Comparative Politics of Southeast Asia. p. 113. PAIK, WOOYEAL 2018. The Institution of Petition and Authoritarian Social Control in Contemporary China. Issues & Studies, Vol. 54, Issue. 02, p. 1850005. Lü, Xiaobo Liu, Mingxing and Li, Feiyue 2018. Policy Coalition Building in an Authoritarian Legislature: Evidence From China’s National Assemblies (1983-2007). Comparative Political Studies, p. 001041401879795. Hernández Company, José Antonio 2018. Parallel authoritarian powers: an explanation of Mexico’s authoritarian regime breakdown. Democratization, p. 1. Teorell, Jan and Wahman, Michael 2018. Institutional stepping stones for democracy: how and why multipartyism enhances democratic change. Democratization, Vol. 25, Issue. 1, p. 78. Ross, Cameron and Panov, Petr 2018. The range and limitation of sub-national regime variations under electoral authoritarianism: The case of Russia. Regional & Federal Studies, p. 1. Seeberg, Merete Bech 2018. Electoral authoritarianism and economic control. International Political Science Review, Vol. 39, Issue. 1, p. 33. Just, Aida 2018. Political Regimes and Immigrant Party Preferences. Comparative Political Studies, p. 001041401879793. Hackenesch, Christine 2018. The EU and China in African Authoritarian Regimes. p. 21. Abdullah, Walid Jumblatt 2018. The Mahathir effect in Malaysia’s 2018 election: the role of credible personalities in regime transitions. Democratization, p. 1. Ong, Lynette H and Han, Donglin 2018. What Drives People to Protest in an Authoritarian Country? Resources and Rewards vs Risks of Protests in Urban and Rural China. Political Studies, p. 003232171876355. Chang, Alex Chuan-hsien 2018. Why do they vote out of habit? Habitual voting under diverse regimes in East Asia. Democratization, Vol. 25, Issue. 2, p. 227. Abdullah, Walid Jumblatt 2018. Selective history and hegemony-making: The case of Singapore. International Political Science Review, Vol. 39, Issue. 4, p. 473. Larreguy, Horacio A Marshall, John and Snyder, James M 2018. Leveling the playing field: How campaign advertising can help non-dominant parties. Journal of the European Economic Association, Vol. 16, Issue. 6, p. 1812. 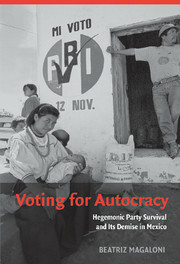 This 2006 book provides a theory of the logic of survival of the Institutional Revolutionary Party (PRI), one of the most resilient autocratic regimes in the twentieth century. An autocratic regime hid behind the facade of elections that were held with clockwise precision. Although their outcome was totally predictable, elections were not hollow rituals. The PRI made millions of ordinary citizens vest their interests in the survival of the autocratic regime. Voters could not simply 'throw the rascals out of office' because their choices were constrained by a series of strategic dilemmas that compelled them to support the autocrats. The book also explores the factors that led to the demise of the PRI. The theory sheds light on the logic of 'electoral autocracies', among the most common type of autocracy, and is the only systematic treatment in the literature today dealing with this form of autocracy. Abramson, Paul R., Aldrich, John H., Paolino, Phil, and Rohde, David W.. 1992. “‘Sophisticated’ Voting in the 1988 Presidential Primaries.” American Political Science Review 82: 55–69. Acemoglu, Daron K., and Robinson, James. 2006. Economic Origins of Dictatorship and Democracy. Cambridge: Cambridge University Press. Achen, Chris. 1989. “Prospective Voting and the Theory of Party Identification.” Unpublished manuscript. Achen, Christopher H. 1992. “Breaking the Iron Triangle: Social Psychology, Demographic Variables and Linear Regression in Voting Research.” Political Behavior 14(3): 195–211. Achen, Christopher H. 1996. “The Timing of Political Liberalization: Taiwan as the Canonical Case.” Paper presented at the annual meeting of the American Political Science Association. Alesina, Alberto. 1987. “Macroeconomic Policy in a Two-party System as a Repeated Game.” Quarterly Journal of Economics 102: 651–78. Alesina, Alberto. 1988. “Credibility and Convergence in a Two-party System with Rational Voters.” American Economic Review 78: 796–805. Alesina, Alberto, Cohen, Gerald D., and Roubini, Nouriel. 1993. “Macroeconomic Policy and Elections in OECD Democracies” Economics and Politics 4: 1–30. Alesina, Alberto, and Rosenthal, Howard. 1995. Partisan Politics, Divided Government and the Economy. Cambridge: Cambridge University Press. Alesina, Alberto, and Roubini, Nouriel. 1997. Political Cycles and the Macroeconomy. Cambridge, Massachusetts: MIT Press. Alvarez, Michael R. 1997. Information and Elections. Ann Arbor:University of Michigan Press. Alvarez, Michael R., and Nagler, Jonathan. 2000. “A New Approach for Modelling Strategic Voting in Multiparty Elections.” British Journal of Political Science 30(1): 57–75. Ames, Barry. 1970. “Bases of Support for Mexico's Dominant Party.” American Political Science Review. 64(1): 153–167. Ames, Barry. 1987. Political Survival. Berkeley and Los Angeles: University of Califorina Press. Arendt, Hannah. 1968. The Origins of Totalitarianism. New York: Harvest Books. Arriola, Leonardo. 2004. “Managing Political Risks: Coups and Clients in African States, 1971–2001.” Unpublished manuscript, Stanford University. Bailey, John. 1994. “Centralism and Political Change in Mexico: The Case of National Solidarity.” In Cornelius, Wayne, Craig, Ann, and Fox, Jonathan (eds. ), Transforming State-Society Relations in Mexico: The National Solidarity Strategy. La Jolla, California: Center for U.S.–Mexican Studies, UCSD. Banks, Arthur. 1976. Cross-national Time Series, 1815–1973. Ann Arbor, Michigan: Inter-University consortium for Political and Social Research. CD-ROM. Barro, Robert. 1997. Determinants of Economic Growth. Cambridge, Massachusetts: MIT Press. Basánez, Miguel. 1994. “Encuestas y Resultados de la Eleccion de 1994.” Este Pais 43: 13–21. Bates, Robert. 1984a. “Some Conventional Orthodoxies in the Study of Agrarian Change.” World Politics 36(2): 234–54. Bates, Robert. 1984b. Markets and States in Tropical Africa. Berkeley: University of California Press. Bates, Robert. 1989. Beyond the Miracle of the Market. New York: Cambridge University Press. Bates, Robert. 2001. Prosperity and Violence. New York: Norton. Bates, Robert, Greif, Avner, Levy, Margaret, Rosenthal, Jean-Laurent, and Weingast, Barry. 1998. Analytic Narratives. Princeton, New Jersey: Princeton University Press. Baumhogger, Goswin. 1999. “Zimbabwe.” In Nohlen, Dieter et al., Elections in Africa: A Data Handbook. Oxford: Oxford University Press. Beck, Thorsten, Clarke, George R., Groff, Alberto, Keefer, Philip, and Walsh, Patrick. 2001. “New Tools in Comparative Political Economy: The Database of Political Institutions.” World Bank Economic Review 15(1): 165–76. Bensusán, Graciela. 2004. “A New Scenario for Mexican Trade Unions: Changes in the Structure of Political and Economic Opportunities.” In Middlebrook, Kevin J. (ed. ), Dilemmas of Political Change in Mexico. London: Institute of Latin American Studies, University of London / Center for U.S.–Mexico Studies, UCSD. Boix, Carles. 2003. Democracy and Redistribution. Cambridge: Cambridge University Press. Boix, Carles, and Stokes, Susan. 2003. “Endogenous Democratization.” World Politics 55 (July): 517–78. Box, G., and Tiao, G.. 1992. Bayesian Inference in Statistical Analysis. New York: John Wiley and Sons. Brandenburg, Frank. 1955. “Mexico: An Experiment in One-Party Democracy.” Ph.D. dissertation, University of Pennsylvania. Brandenburg, Frank. 1964. The Making of Modern Mexico. Englewood Cliffs, New Jersey: Prentice-Hall. Bratton, Michael, and Walle, Nicholas. 1997. Democratic Experiments in Africa: Regime Transitions in Comparative Perspective. New York: Cambridge University Press. Bruhn, Kathleen. 1996. “Social Spending and Political Support: The ‘Lessons’ of the National Solidarity Program in Mexico.” Comparative Politics 26(January): 151–77. Bruhn, Kathleen. 1997. Taking on Goliath. University Park: Pennsylvania State University Press. Buendía, Jorge. 1996. “Economic Reform, Public Opinion and Presidential Approval in Mexico 1988–1993.” Comparative Political Studies 29(October): 566–92. Buendía, Jorge. 2001. “Economic Reforms and Political Support in Mexico.” In Stokes, Susan (ed. ), Public Support for Market Reforms in New Democracies. Cambridge: Cambridge University Press. Bueno de Mesquita, Bruce, et al. 2003. The Logic of Political Survival. Cambridge, Massachusetts: MIT Press. Camp, Roderic. 1992. Generals in the Palacio: The Military in Modern Mexico. New York: Oxford University Press. Camp, Roderic. 1995. Political Recruitment across Two Centuries: Mexico 1884–1991. Austin: University of Texas Press. Camp, Roderic. 1999. Politics in Mexico: The Decline of Authoritarianism. Oxford: Oxford University Press. Campbell, Angus, Converse, Philip E., Miller, Warren E., and Stokes, Donald E.. 1960. The American Voter. New York: Wiley. Campuzano, Irma. 1995. Baja California en los Tiempos del PAN. México: La Jornada Ediciones. Castañeda, Jorge. 1995. The Mexican Shock. New York: The New Press. Castañeda, Jorge. 2000. Perpetuating Power: How Mexican Presidents Were Chosen. New York: The New Press. Casar, María Amparo. 2002. “Executive-Legislative Relations: The Case of Mexico (1946–1997).” In Nacif, Benito and Morgenstern, Scott (eds. ), Legislative Politics in Latin America. New York: Cambridge University Press. Chand, Vikram. 2001. Mexico's Political Awakening. South Bend, Indiana: University of Notre Dame Press. Chandra, Kanchan. 2004. Why Ethnic Parties Succeed: Patronage and Ethnic Head Counts in India. Cambridge: Cambridge University Press. Chehabi, H. E., and Linz, eds Juan J.. 1998. Sultanistic Regimes. Baltimore: Johns Hopkins University Press. Chull Shin, Doh. 1994. “On the Third Wave of Democratization. A Synthesis and Evaluation of Recent Theory and Research.” World Politics 47 (October): 135–70. Cinta, Alberto. 1999. “Uncertainty and Electoral Behavior in Mexico in the 1997 Congressional Elections.” In Domínguez, Jorge I. and Poiré, Alejandro (eds. ), Toward Mexico's Democratization: Parties, Campaigns, Elections and Public Opinion. New York: Routledge. Collier, David, and Collier, Ruth B.. 1991. Shaping the Political Arena. Princeton, New Jersey: Princeton University Press. Collier, Ruth B. 1992. The Contradictory Alliance: State-Labor Relations and Regime Change in Mexico (Research Series No. 83). Berkeley: Institute of International Studies, University of California. Colomer, Josep. 1991. “Transitions by Agreement: Modeling the Spanish Way.” American Political Science Review 85(4): 1283–1302. Colomer, Josep, and Pascual, Margot. 1994. “The Polish Games of Transition.” Communist and Post-Communist Studies 27(3): 275–94. Cornelius, Wayne A. 1975. Politics and the Migrant Poor in Mexico City. Stanford, California: Stanford University Press. Cornelius, Wayne. 2004. “Mobilized Voting in the 2000 Elections: The Changing Efficacy of Vote Buying and Coercion in Mexican Electoral Politics.” In Domínguez, Jorge and Lawson, Chappell, eds. Mexico's Pivotal Democratic Election: Campaign Effects and the Presidential Race of 2000. Stanford, California: Stanford University Press. Cornelius, Wayne, Craig, Ann, and Fox, Jonathan, eds. 1994. Transforming State-Society Relations in Mexico: The National Solidarity Strategy. La Jolla, California: Center for U.S.–Mexican Studies, UCSD. Cornelius, Wayne, Gentleman, Judith, and Smith, Peter, eds. 1989. Mexico's Alternative Political Futures. La Jolla, California: Center for U.S.–Mexico Studies, UCSD. Cox, W. Gary. 1991. “SNTV and d'Hont are ‘Equivalent’.” Electoral Studies 10: 118–32. Cox, W. Gary. 1994. “Strategic Voting Equilibria under the Single Nontransferable Vote.” American Political Science Review 88: 608–21. Cox, W. Gary, and McCubbins, Mathew D.. 1986. “Electoral Politics as a Redistributive Game.” Journal of Politics 48(May): 370–89. Cox, W. Gary, and Thies, Michael. 2000. “How Much Does Money Matter? ‘Buying Votes’ in Japan, 1967–1990.” Comparative Political Studies 33(1): 37–57. Cowen, Michael, and Laakso, Liisa. 2002. Multi-Party Politics in Africa. New York: Palgrave. Craig, Ann, and Wayne Cornelius. 1995. “Houses Divided. Parties and Political Reform in Mexico.” In Mainwaring, Scott and Scully, Timothy R. (eds. ), Building Democratic Institutions: Party Systems in Latin America. Stanford, California: Stanford University Press. Crespo, José Antonio. 1992. “Crisis Economica = Crisis de Legitimidad.” In Bazdresch, Carlos (ed. ), Mexico: Auge, Crisis y Ajuste. Vol. 1. México: Fondo de Cultura Económica. Crespo, José Antonio. 2004. “Party Competition in Mexico: Evolution and Prospects.” In Middlebrook, Kevin (ed. ), Dilemmas of Political Change in Mexico. London: Institute of Latin American Studies, University of London/Center for U.S.–Mexico Studies, UCSD. Cukierman, Alex, and Meltzer, Allan. 1986. “A Positive Theory of Discretionary Policy, the Cost of Democratic Government, and the Benefits of a Constitution.” Economic Inquiry 24: 367–88. Dahl, Robert. 1971. Polyarchy. New Haven, Connecticut: Yale University Press. Dahl, Robert, ed. 1973. Regimes and Oppositions. New Haven, Connecticut: Yale University Press. Dahlberg, Matz, and Johansson, Eva. 2002. “On the Vote-Purchasing Behavior of Incumbent Governments.” American Political Science Review 96(1): 27–40. Davids, A. Otto, Hinich, Melvin J., and Ordeshook, Peter C.. 1970. “An Expository Development of a Mathematical Model of Electoral Process.” American Political Science Review 64: 426–48. Miguel, Madrid H.. 2004. Cambio de Rumbo. México: Fondo de Cultura Económica. Deutsch, Karl W. 1961. “Social Mobilization and Political Development.” American Political Science Review 55(3): 493–514. Di Palma, Giuseppe. 1990. To Craft Democracies. Berkeley: University of California Press. Diamond, Larry. 2002. “Elections without Democracy: Thinking about Hybrid Regimes.” Journal of Democracy 13.2(April): 21–35. Diamond, Larry, et al., eds. 1989. Democracy in Developing Countries: Asia. Boulder, Colorado: Lynne Rienner. Diaz-Cayeros, Alberto. 1997. “Political Responses to Regional Inequality: Taxation and Distribution in Mexico.” Ph.D. dissertation, Duke University. Diaz-Cayeros, Alberto. 2004. “Decentralization, Democratization and Federalism in Mexico.” In Middlebrook, Kevin (ed. ), Dilemmas of Political Change in Mexico. London: Institute of Latin American Studies, University of London / Center for U.S.–Mexico Studies, UCSD. Diaz-Cayeros, Alberto, Federico Estévez, and Beatriz Magaloni. 2002. “The Erosion of One-Party Rule: Clientelism, Portfolio Diversification and Electoral Strategy.” Paper presented at the annual meeting of the American Political Science Association, Boston, August 29–September 1. Diaz-Cayeros, Alberto, and Beatriz Magaloni. 1995. “Transition Games: Initiating and Sustaining Democracy.” Paper presented at the annual meeting of the American Political Science Association, September. Díaz-Cayeros, Alberto, and Magaloni, Beatriz. 2001. “Party Dominance and the Logic of Electoral Design in Mexico's Transition to Democracy.” Journal of Theoretical Politics 13(3): 271–93. Diaz-Cayeros, Alberto, Beatriz Magaloni, and Barry Weingast. 2004. “Democratization and the Economy in Mexico: Equilibrium (PRI) Hegemony and Its Demise.” Unpublished manuscript, Stanford University. Dixit, Avinash, and Londregan, John. 1996. “The Determinants of Success of Special Interests in Redistributive Politics.” Journal of Politics. 58(November): 1132–55. Domínguez, Jorge. 1999. “The Transformation of Mexico's Electoral and Party Systems 1988–97.” In Domínguez, Jorge and Poiré, Alejandro (eds. ), Toward Mexico's Democratization: Parties, Campaigns, Elections and Public Opinion. New York: Routledge. Domínguez, Jorge. 2004. “Why and How Did Mexico's 2000 Presidential Election Campaign Matter.” In Domínguez, Jorge and Lawson, Chappell (eds. ), Mexico's Pivotal Democratic Election: Campaign Effects and the Presidential Race of 2000. Stanford, California: Stanford University Press. Domínguez, Jorge, and Lawson, Chappell, eds. 2004. Mexico's Pivotal Democratic Election: Campaign Effects and the Presidential Race of 2000. Stanford, California: Stanford University Press. Domínguez, Jorge I., and McCann, James A.. 1995. “Shaping Mexico's Electoral Arena: Construction of Partisan Cleavages in the 1988 and 1991 National Elections.” American Political Science Review 89: 34–48. Domínguez, Jorge, and McCann, James. 1996. Democratizing Mexico: Public Opinion and Electoral Choices. Baltimore: Johns Hopkins University Press. Domínguez, Jorge, and Poiré, Alejandro, eds. 1999. Toward Mexico's Democratization: Parties, Campaigns, Elections and Public Opinion. New York: Routledge. Dow, Jay K., and Endersby, James W.. 2004. “Multinomial Probit and Multinomial Logit: A Comparison of Choice Models for Voting Research.” Electoral Studies 23(1): 107–122. Dresser, Denise. 1991. Neopopulist Solutions to Neoliberal Problems: Mexico's National Solidarity Program. La Jolla, California: Center for U.S.–Mexican Studies, UCSD. Dresser, Denise. 1994. “Bringing the Poor Back In: National Solidarity as a Strategy of Regime Legitimation.” In Cornelius, Wayne, Craig, Ann, and Fox, Jonathan (eds. ), Transforming State-Society Relations in Mexico: The National Solidarity Strategy. La Jolla, California: Center for U.S.–Mexican Studies, UCSD. Duverger, Maurice. 1986. “Duverger's Law: Forty Years Later.” In Grofman, Bernard and Lijphart, Arend (eds. ), Electoral Laws and Their Political Consequences. New York: Agathon Press. Edwards, Sebastian, and Dornbusch, Rudiger, eds. 1991. The Macroeconomics of Populism in Latin America. Cambridge, Massachusetts: MIT Press. Eisenstadt, S. N., and Lemarchand, Rene. 1981. Political Clientelism, Patronage and Development. London: SAGE Publications. Eisenstadt, Todd. 2004. Courting Democracy in Mexico. Cambridge: Cambridge University Press. Enelow, M. James, and Hinich, Melvin J.. 1984. The Spatial Theory of Voting. New York: Cambridge University Press. Erikson, Robert S. 1989. “Economic Conditions and Presidential Vote.” American Political Science Review 83: 567–73. Estévez, Federico, and Magaloni, Beatriz. 2000. “Partidos Legislativos y sus Electorados en la Batalla Presupuestal de 1997.” ITAM Working Papers in Politics. Fearon, James. 2000. “Why Use Elections to Allocate Power?” Unpublished manuscript, Stanford University. Ferejohn, John A. 1986 “Incumbent Performance and Electoral Control.” Public Choice 50: 5–25. Fiorina, Morris P. 1981. Retrospective Voting in American National Elections. New Haven, Connecticut: Yale University Press. Foeken, Richard, and Tom Dietz. 2000. “Of Ethnicity, Manipulation and Observation: The 1992 and 1997 Elections in Kenya.” In Abbinik, Jon and Hesseling, Gerti (eds. ), Election Observation and Democratization in Africa. New York: St. Martin's Press. Fox, Jonathan. 1994. “The Difficult Transition from Clientelism to Citizenship: Lessons from Mexico.” World Politics 46(2): 151–84. Gandhi, Jennifer, and Adam Przeworski. 2001. “Dictatorial Institutions and the Survival of Dictators.” Paper presented at the annual meeting of the American Political Science Association, August 30–September 2. Geddes, Barbara. 1994. Politician's Dilemma: Building State Capacity in Latin America. Berkeley: University of California Press. Geddes, Barbara. 1999. “Authoritarian Breakdown: Empirical Test of a Game Theoretic Argument.” Paper presented at the annual meeting of the American Political Science Association, Atlanta, Georgia, September. Geddes, Barbara. 2003. Paradigms and Sand Castles: Research Design in Comparative Politics. Ann Arbor: University of Michigan Press. Gellner, Ernest, and Waterbury, John. 1977. Patrons and Clients. London: Duckworth. Gershberg, Alec Ian. 1994. “Distributing Resources in the Education Sector.” In Cornelius, Wayne, Craig, Ann, and Fox, Jonathan (eds. ), Transforming State-Society Relations in Mexico: The National Solidarity Strategy. La Jolla, California: Center for U.S.–Mexican Studies, UCSD. Glickman, Harvey, ed. 1995. Ethnic Conflict and Democratization in Africa. Atlanta, Georgia: African Studies Association Press. Golden, Miriam. 2004. “International Economic Sources of Regime Change: How European Economic Integration Undermined Italy's Postwar Party System.” Comparative Political Studies 37(December): 1238–74. Golden, Miriam, and Chang, Eric. 2001. “Competitive Corruption: Factional Conflict and Political Malfeasance in Postwar Italian Christian Democracy.” World Politics 53(4): 588–622. Gómez, Edmund T., and Jomo, K. S.. 1997. Malaysia's Political Economy: Politics, Patronage and Profits. Cambridge: Cambridge University Press. Gómez López, Marcela, and Sandra Pineda Antúnez. 1999. El Reparto Municipal del Pronasol: Criterios de Asignación en Aguascalientes y Michoacán. B.A. thesis, ITAM, Mexico. Gómez Tagle, Silvia. 1997. La Transición Inconclusa: Treinta Años de Elecciones en México. México: El Colegio de México. González, María de Los Angeles. 2002. “Do Changes in Democracy Affect the Political Budget Cycle? Evidence from Mexico.” Review of Development Economics 6(2): 204–24. González Casanova, Pablo. 1965. La Democracia en México. México City: ERA. Haggard, Stephan, and Kaufman, Robert, eds. 1992. The Politics of Economic Adjustment. Princeton, New Jersey: Princeton University Press. Haggard, Stephan, and Kaufman, Robert. 1995. The Political Economy of Democratic Transitions. Princeton, New Jersey: Princeton University Press. Haggard, Stephan, and Kaufman, Robert. 1999. “The Political Economy of Democratic Transitions.” In Anderson, Lisa (ed. ), Transitions to Democracy. New York: Columbia University Press. Haggard, Stephan, and Webb, Steven. 1994. Voting for Reform. Washington, D.C.: World Bank. Hansen, Roger D. 1974. The Politics of Mexican Development. Baltimore and London: Johns Hopkins University Press. Havel, Vaclav. 1992. Open Letters. New York: Vintage. Heath, Jonathan. 1999. Mexico and the Sexenio Curse: Presidential Successions and Economic Crises in Modern Mexico. Washington, D.C.: Center for Strategic and International Studies. Hibbs, Douglas A. 1987. The American Political Economy. Cambridge, Massachusetts: Harvard University Press. Hilley, John. 2001. Malaysia: Mahathirism, Hegemony and the New Opposition. London: Zed Books. Hinich, Melvin, and Munger, Michael. 1994. Ideology and the Theory of Political Choice. Ann Arbor: University of Michigan Press. Hirschman, Albert. 1981. “Exit, Voice and the State.” In his Essays in Trespassing. Cambridge: Cambridge University Press. Hiskey, Jonathan. 1999. “Does Democracy Matter? Electoral Competition and Local Development in Mexico.” Ph.D. dissertation, University of Pittsburgh. Hiskey, Jonathan. 2003. “Demand Based Development and Local Electoral Environments.” Comparative Politics 36(1): 41–60. Honaker, James, et al. 2001. “AMELIA: A Program for Missing Data (Windows Version).” Cambridge, Massachusetts: Harvard University Press. Huntington, Samuel P. 1968. Political Order in Changing Societies. New Haven, Connecticut: Yale University Press. Huntington, Samuel P. 1970. “Social and Institutional Dynamics of One-Party Systems.” In Huntington, Samuel P. and Moore, Clement H. (eds. ), Authoritarian Politics in Modern Society. New York: Basic Books. Ingham, Kenneth. 1990. Politics in Modern Africa: The Uneven Tribal Dimension. New York and London: Routledge. Joseph, Richard. 1999. “Democratization in Africa after 1989: Comparative and Theoretical Perspectives.” In Anderson, Lisa (ed. ), Transitions to Democracy. New York: Columbia University Press. Karl, Terry L. 1990. “Dilemmas of Democratization in Latin America.” Comparative Politics 23(1): 1–23. Karl, Terry L. 1997. The Paradox of Plenty: Oil Booms and Petro-States. Berkeley: University of California Press. Karl, Terry L., and Schmitter, Philippe. 1991. “Modes of Transition in Latin America, Southern and Eastern Europe.” International Social Science Journal 128(May): 269–84. Kasara, Kimuli. 2005. “A Prize Too Large to Share: Opposition Coalitions and the Kenyan Presidency, 1991–2002.” Unpublished manuscript, Stanford University. Kaufman, Robert. 1977a. “Corporatism, Clientelism, and Partisan Conflict: A Study of Seven Countries.” In Malloy, James M. (ed. ), Authoritarianism and Corporatism in Latin America. Pittsburgh: University of Pittsburgh Press. Kaufman, Robert. 1977b. “Mexico and Latin American Authoritarianism.” In Reyna, Jose Luis and Weinert, Richard S. (eds. ), Authoritarianism in Mexico. Philadelphia: Institute for the Study of Human Issues. Kaufman, Robert, Carlos Bazdresh, and Blanca Heredis. 1994. “Mexico: Radical Reform in a Dominant Party System.” In Haggard, Stephen and Webb, Steven B. (eds. ), Voting for Reform. New York: Oxford University Press. Kaufman, Robert R., and Trejo, Guillermo. 1996. “Regionalismo, Transformación del régimen y Pronasol: La Política del Programa Nacional de Solidaridad en Cuatro Estados Mexicanos.” Política y Gobierno 3(2): 245–80. Kaufman, Robert R., and Trejo, Guillermo. 1997. “Regionalism, Regime Transformation, and PRONASOL: The Politics of the National Solidarity Programme in Four Mexican States.” Journal of Latin American Studies 29: 717–45. Kaufman, Robert, and Zuckerman, Leo. 1998. “Attitudes toward Economic Reform in Mexico: The Role of Political Orientations.” American Political Science Review 92(2): 359–75. Keech, William R. 1995. Economic Politics. Cambridge: Cambridge University Press. Keefer, Phil. 2003. “Clientelism, Development and Democracy.” Unpublished manuscript, World Bank. Key, V. O., Jr. 1955. “A Theory of Critical Elections.” Journal of Politics 17(February): 3–18. Key, V. O. Jr. 1966. The Responsible Electorate: Rationality in Presidential Voting 1936–1060. Cambridge, Massachusetts: Harvard University Press. Kiewiet, Roderick D. 1983. Macroeconomics and Micropolitics. Chicago: University of Chicago Press. King, Gary, et al. 2001. “Analyzing Incomplete Political Science Data: An Alternative Algorithm for Multiple Imputation.” American Political Science Review 95(1): 49–69. Kitschelt, Herbert. 1992. “Review: Comparative Historical Research and Rational Choice Theory: The Case of Transitions to Democracy.” Theory and Society. 22(3): 413–27. Kitschelt, Herbert. 2000. “Linkages between Citizens and Politicians in Democratic Politics.” Comparative Political Studies 33(6/7): 845–79. Klesner, Joseph. 1988. “Electoral Reform in an Authoritarian Regime: The Case of Mexico.” Ph.D. dissertation, MIT. Klesner, Joseph. 1993. “Modernization, Economic Crisis and Electoral Alignment in Mexico.” Mexican Studies/Estudios Mexicanos 9(2): 187–223. Klesner, Joseph. 1994. “Realignment or Dealignment? Consequences of Economic Crisis and Restructuring for the Mexican Party System.” In Maria Lorena Cook, Middlebrook, Kevin J., and Molinar, Juan, (eds. ), Politics of Economic Restructuring State-Society Relations and Regime Change in Mexico. La Jolla: center for U.S.–Mexican Studies, University of California at San Diego. Klesner, Joseph, and Chappell Lawson. 2004. “Political Reform, Electoral Participation, and the Campaign of 2000.” In Domíguez, Jorge I. and Lawson, Chappell (eds. ), Mexico's Pivotal Democratic Elections. Stanford, California: Stanford University Press. Kuran, Timur. 1991. “Now Out of Never: The Element of Surprise in East European Revolutions of 1989.” World Politics 44: 7–48. Laver, Michael, and Schofield, Norman. 1991. Multiparty Government: The Politics of Coalition in Europe. Oxford: Oxford University Press. Lawson, Chappell. 1999. “Why Cárdenas Won: The 1997 Election in Mexico City.” In Domínguez, Jorge I. and Poiré, Alejandro (eds. ), Toward Mexico's Democratization: Parties, Campaigns, Elections and Public Opinion. New York: Routledge. Lawson, Chappell. 2002. Building the Fourth Estate: Democratization and the Rise of a Free Press in Mexico. Berkeley: University of California Press. Lawson, Chappell. 2004a. “Television Coverage, Vote Choice, and the 2000 Campaign.” In Domínguez, Jorge and Lawson, Chappell (eds. ), Mexico's Pivotal Democratic Election: Campaign Effects and the Presidential Race of 2000. Stanford, California: Stanford University Press. Lawson, Chappell. 2004b. “Building the Fourth Estate: Media Opening and Democratization in Mexico.” In Middlebrook, Kevin (ed. ), Dilemmas of Political Change in Mexico. London: Institute of Latin American Studies, University of London/Center for U.S.–Mexico Studies, UCSD. Lemarchand, Rene. 1972. “Political Clientelism and Ethnicity in Tropical Africa: Competing Solidarities in Nation Building.” American Political Science Review 66(1): 68–90. Lemarchand, Rene, and Legg, Keith. 1972. “Political Clientelism and Development: A Preliminary Analysis.” Comparative Politics 4(2): 149–78. Lerner, Daniel. 1958. The Passing of Traditional Society. Glencoe, Illinois: Free Press. Levitzky, Steven, and Way, Lucan A.. 2002. “The Rise of Competitive Authoritarianism.” Journal of Democracy 13(2): 51–65. Lewis-Beck, Michael. 1988. Economics and Elections. Ann Arbor: University of Michigan Press. Lichbach, Mark. 1998. The Rebel's Dilemma. Ann Arbor: University of Michigan Press. Lijphart, Arend. 1984. Democracies: Patterns of Majoritarian and Consensus Government in Twenty-One Countries. New Haven, Connecticut: Yale University Press. Lin, Jih-weh. 2003. “Transition through Transaction: Taiwan's Constitutional Reforms in the Lee Teng-hui Era.” In Lee, Wei-chin and Wang, T. Y (eds. ), Sayonara to the Lee Teng-hui Era. Lanham: University of Maryland Press. Lindbeck, Assar. 1976. “Stabilization Policies in Open Economics with Endogenous Politicians.” American Economic Review Papers and Proceedings, 1–19. Lindbeck, Assar, and Weibull, Jörgen. 1987. “Balanced-Budget Redistribution as the Outcome of Political Competition.” Public Choice 52(2): 273–97. Linz, Juan J. 2000. Totalitarian and Authoritarian Regimes. Boulder, Colorado: Lynne Rienner. Lipset, Seymour Martin. 1957. Political Man: The Social Basis of Politics. Baltimore: Johns Hopkins University Press. Lipset, Seymour Martin. 1959. “Some Social Requisites of Democracy: Economic Development and Political Legitimacy.” American Political Science Review 53(1): 69–105. Loaeza, Soledad. 1989. El Llamado a las Urnas. Mexico City: Cal y Arena. Loaeza, Soledad. 1999. El Partido Acción Nacional, la larga marcha, 1939–1994: Oposición Leal y Partido de Protesta. México: Fondo de Cultura Económica. Loaeza, Soledad. 2003. “The National Action Party (PAN): From the Fringes of the Political System to the Heart of Change.” In Mainwaring, Scott and Scully, Timothy(eds. ), Christian Democracy in Latin America. Stanford, California: Stanford University Press. Lohmann, Sussane. 1994. “The Dynamics of Informational Cascades: The Monday Demonstrations in Leipzig, East Germany, 1989–91.” World Politics. 47(1): 42–101. Lujambio, Alonso. 2000. El Poder Compartido. México: Oceano. Lujambio, Alonso. 2001. “Democratization through Federalism? The National Action Party Strategy, 1939–1995.” In Middlebrook, Kevin J. (ed. ), Party Politics and the Struggle for Democracy in Mexico: National and State Level Analyses of the Partido Accion Nacional. La Jolla, California: Center for U.S.–Mexican Studies, UCSD. Lustig, Nora. 1992. Mexico: The Remaking of an Economy. Washington, D.C.: Brookings Institution. Lust-Okar, Ellen. 2005. Structuring Conflict in the Arab World. Cambridge: Cambridge University Press. MacKuen, Michael B., Erikson, Robert S., and Stimson, James A.. 1992. “Peasants and Bankers: The American Electorate and the US Economy.” American Political Science Review 86: 597–611. Magaloni, Beatriz. 1994. “Elección Racional y Voto Estratégico: Algunas Aplicaciones al caso Mexicano.” Política y Gobierno 1(2): 309–44. Magaloni, Beatriz. 1996. “Dominio de Partido y Dilemas Duvergerianos en las Elecciones Presidenciales de 1994.” Política y Gobierno 3: 281–326. Magaloni, Beatriz. 1997. “The Dynamics of Dominant Party Decline: The Mexican Transition to Multipartyism.” Ph.D. dissertation, Duke University. Magaloni, Beatriz. 1999. “Is the PRI Fading? Economic Performance, Electoral Accountability and Voting Behavior in the 1994 and 1997 Elections.” In Domínguez, Jorge I. and Poiré, Alejandro (eds. ), Toward Mexico's Democratization: Parties, Campaigns, Elections and Public Opinion. New York: Routledge. Magaloni, Beatriz. 2003. “Authoritarianism, Democracy and the Supreme Court: Horizontal Exchange and the Rule of Law in Mexico.” In Mainwaring, Scott and Welna, Christopher (eds. ), Democratic Accountability in Latin America. Oxford: Oxford University Press. Magaloni, Beatriz. 2004. “Contested Elections, Electoral Fraud and the Transition Game.” Unpublished manuscript, Stanford University. Magaloni, Beatriz. 2005. “The Demise of Mexico's One-Party Dominant Regime: Elite Choices and the Masses in the Establishment of Democracy.” In Frances, Haggopian and Mainwaring, Scott (eds. ), The Third Wave of Democratization in Latin America. Cambridge: Cambridge University Press. Magaloni, Beatriz, Alberto Diaz-Cayeros, and Federico Estévez. (forthcoming) “Private versus Public Goods as Electoral Investments: A Portfolio Diversification Model with Evidence from Mexico.” In Kitschelt, Herbert and Wilkinson, Steven (eds. ), Patrons, Clients and Policies: Patterns of Democratic Accountability and Competition. London: Cambridge University Press. Magaloni, Beatriz, Alberto Diaz-Cayeros, and Federico Estévez. 2000. “Federalism, Redistributive Politics and Poverty Relief Spending: The Programa Nacional de Solidaridad in Mexico (1989–1994).” Paper delivered at the annual meeting of the American Political Science Association, Washington, D.C.
Magaloni, Beatriz, and Alejandro Moreno. 2003. “Catching All Souls: The Partido Acción Nacional and the Politics of Religion in Mexico.” In Mainwaring, Scott and Scully, Timothy (eds. ), Christian Democracy in Latin America. Stanford, California: Stanford University Press. Magaloni, Beatriz, and Alejandro Poiré. 2004a. “The Issues, the Vote and the Mandate for Change.” In Dominguez, Jorge and Lawson, Chappell (eds. ), Mexico's Pivotal Democratic Election: Campaign Effects and the Presidential Race of 2000Stanford, California: Stanford University Press. Magaloni, Beatriz, and Alejandro Poiré. 2004b. “Strategic Coordination in the 2000 Mexican Presidential Race.” In Dominguez, Jorge and Lawson, Chappell (eds. ), Mexico's Pivotal Democratic Election: Campaign Effects and the Presidential Race of 2000. Stanford, California: Stanford University Press. Mainwaring, Scott, and Aníbal Perez Liñán. 2005. “Latin American Democratization since 1978.” In Haggopian, Frances and Mainwaring, Scott (eds. ), The Third Wave of Democratization in Latin America, Cambridge: Cambridge University Press. Mainwaring, Scott, and Shugart, Matthew, eds. 1997. Presidentialism and Democracy in Latin America. Cambridge: Cambridge University Press. Malloy, James A., ed. 1977. Authoritarianism and Corporatism in Latin America. Pittsburgh: University of Pittsburgh Press. Marawall, Ignacio, and Adam Przeworski. 2003. “Introduction.” In Marawall, Ignacio and Przeworski, Adam (eds. ), Democracy and the Rule of Law. Cambridge: Cambridge University Press. Medina, Luis. 1978. Evolución Electoral en el México Contemporáneo. México: Gaceta Informativa de la Comisión Federal Electoral. Middlebrook, Kevin. 1986. “Political Liberalization in an Authoritarian Regime: The Case of Mexico.” In O'Donnell, Guillermo, Schmitter, Philippe, and Whitehead, Lawrence (eds. ), Latin America, Pt.2, Transitions from Authoritarian Rule: Prospects for Democracy. Baltimore: Johns Hopkins University Press. Middlebrook, Kevin. 1995. The Paradox of Revolution: Labor, the State and Authoritarianism in Mexico. Baltimore: Johns Hopkins University Press. Middlebrook, Kevin. 2004. “Mexico's Democratic Transitions: Dynamics and Prospects.” In Middlebrook, Kevin J. (ed. ), Party Politics and the Struggle for Democracy in Mexico: National and State Level Analyses of the Partido Acción Nacional. La Jolla, California: Center for U.S.–Mexican Studies, UCSD. Molinar Horcasitas, Juan. 1987. “Regreso a Chihuahua.” Nexos 111(March): 21–32. Molinar Horcasitas, Juan. 1991. El Tiempo de la Legitimidad. Elecciones, Autoritarismo y Democracia en México. México: Cal y Arena. Molinar Horcasitas, Juan. 1996. “Changing the Balance of Power in a Hegemonic Party System: The Case of Mexico.” In Lijphart, Arendt and Waisman, Carlos (eds. ), Institutional Design in New Democracies: Eastern Europe and Latin America. Boulder, Colorado: Westview Press. Molinar Horcasitas, Juan, and Weldon, Jeffrey. 1990. “Elecciones de 1988 en Mexico: Crisis del Autoritarismo.” Revista Mexicana de Sociología 52(4): 229–62. Molinar Horcasitas, Juan, and Jeffrey Weldon. 1994. “Electoral Determinants and Consequences of National Solidarity.” In Cornelius, Wayne, Craig, Ann, and Fox, Jonathan (eds. ), Transforming State-Society Relations in Mexico: The National Solidarity Strategy. La Jolla, California: Center for U.S.–Mexican Studies, UCSD. Moore, Clement H. 1970. “The Single Party as a Source of Legitimacy.” In Samuel Huntington and Clement H. Moore (eds. ), Authoritarian Politics in Modern Society. New York: Basic Books. Moreno, Alejandro. 1998. “Party Competition and the Issue of Democracy: Ideological Space in Mexican Elections.” In Mónica Serrano (ed. ), Governing Mexico: Political Parties and Elections. London: University of London Press. Moreno, Alejandro. 1999a. “Campaign Awareness and Voting in the 1997 Mexican Congressional Elections.” In Domínguez, Jorge and Poiré, Alejandro (eds. ), Toward Mexico's Democratization: Parties, Campaigns, Elections and Public Opinion. New York: Routledge. Moreno, Alejandro. 1999b. Political Cleavages: Issues, Parties, and the Consolidation of Democracy. Boulder, Colorado: Perseus. Moreno, Alejandro. 2003. El Votante Mexicano. México: Fondo de Cultura Económica. Moreno, Alejandro. 2004. “The Effects of Negative Campaigns on Mexican Voters.” In Domínguez, Jorge and Lawson, Chappell (eds. ), Mexico's Pivotal Democratic Election: Campaign Effects and the Presidential Race of 2000. Stanford, California: Stanford University Press. Morgenstern, Scott, and Zechmeister, Elizabeth. 2001. “Better the Devil You Kow than the Saint You Don't? Risk Propensity and Vote Choice in Mexico.” Journal of Politics 63(1): 93–119. Neocosmos, Michael. 2003. “The Politics of National Elections in Botswana, Lesotho and Swaziland.” In Cowen, Michael and Laakso, Lisa (eds. ), Multiparty Elections in Africa. New York: Palgrave. Nie, Norman H., Verba, Sidney, and Petrocik, John. 1979. The Changing American Voter, enl. ed. Cambridge, Massachusetts: Harvard University Press. Niemi, Richard G., and Weisberg, Herbert F.. 1993. Classics in Voting Behavior. Washington, D.C.: Congressional Quarterly. Nordhaus, William. 1975. “The Political Buisnesss Cycle.” Review of Economic Studies 42: 169–90. O'Donnell, Guillermo. 1973. Modernization and Bureaucratic Authoritarianism: Studies in South American Politics. Berkeley: University of Califorinia, Institute of International Studies. O'Donnell, Guillermo, and Schmitter, Philippe C.. 1986. Transitions from Authoritarian Rule: Tentative Conclusions about Uncertain Democracies. Baltimore: Johns Hopkins University Press. Olson, Mancur. 2000. Power and Prosperity: Outgrowing Communist and Capitalist Dictatorships. New York: Basic Books. Ordeshook, Peter C., and Shvetsova, Olga. 1994. “Ethnic Heterogeneity, District Magnitude, and the Number of Parties.” American Journal of Political Science 38: 100–23. Ozbudun, Ergun. 1989. “Turkey: Crisis, Interruptions, and Reequilibration.” In Diamond, Larry et al. (eds. ), Democracy in Developing Countries: Asia. Boulder: Lynne Rienner. Pacheco Méndez, Guadalupe. 1995. “Los Resultados Electorales de 1994.” In Moncayo, Pablo Pascual (ed. ), Las Elecciones de 1994. México: Cal y Arena. Palfrey, Thomas. 1989. “A Mathematical Proof of Duverger's Law.” In Ordeshook, Peter C. (ed. ), Models of Strategic Choice in Politics. Ann Arbor: University of Michigan Press. Pempel, T. J., ed. 1990. Uncommon Democracies: The One-Party Dominant Regimes. Ithaca, New York: Cornell University Press. Persson, Torsten, and Tabellini, Guido. 1990. Macroeconomic Policy, Credibility and Politics. Chur, Switzerland and New York: Harwood Academic Publishers. Pessino, Carola. 1991. “From Aggregate Shocks to Labor Market Adjustments: Shifting of Wage Profiles under Hyperinflation in Argentina.” Unpublished manuscript. Pinkney, Robert. 1997. Democracy and Dictatorship in Ghana and Tanzania. Ipswich: MacMillan Press. Poiré, Alejandro. 1999. “Retrospective Voting, Partisanship and Loyalty in Presidential Elections: 1994.” In Domínguez, Jorge I. and Poiré, Alejandro (eds. ), Toward Mexico's Democratization: Parties, Campaigns, Elections and Public Opinion. New York: Routledge. Posner, Daniel. 2005. Institutions and Ethnic Politics in Africa. Cambridge: Cambridge University Press. Powell, G. B., and Whitten, G. D.. 1993. “A Cross-National Analysis of Economic Voting: Taking Account of Political Context.” American Journal of Political Science 37(2): 391–414. Przeworski, Adam. 1987. “Democracy as a Contingent Outcome of Conflicts.” In Elster, Jon and Slagstad, Rune (eds. ), Constitutionalism and Democracy. Cambridge: Cambridge University Press. Przeworski, Adam. 1991. Democracy and the Market. Cambridge: Cambridge University Press. Przeworksi, Adam. 2000. Democracy and Development: Political Institutions and Well-Being in the World, 1950–1990. Cambridge: Cambridge University Press. Rae, Douglas. 1971. The Political Consequences of Electoral Laws, rev. ed. New Haven, Connecticut: Yale University Press. Reed, Steven R. 1990. “Structure and Behaviour: Extending Duverger's Law to the Japanese Case.” British Journal of Political Science 20(3): 335–56. Remmer, Karen. 1993. “The Political Impact of Economic Crisis in Latin America in the 1980s.” American Political Science Review 85(3): 777–800. Riker, William H. 1962. The Theory of Political Coalitions. New Haven, Connecticut: Yale University Press. Riker, William H. 1976. “The Number of Political Parties: A Reexamination of Duverger's Law.” Comparative Politics 9: 93–106. Riker, William H. 1982. “The Two Party System and Duverger's Law: An Essay on the History of Political Science.” American Political Science Review 76: 753–66. Riker, William H., and Ordeshook, Peter C.. 1968. “A Theory of the Calculus of Voting.” American Political Science Review 62: 25–43. Robinson, James A., and Thierry Verdier. 2002. “The Political Economy of Clientelism.” Unpublished manuscript, University of California, Berkeley. Rodríguez, Victoria E. 1995. “Municipal Autonomy and the Politics of Intergovernmental Finance: Is It Different for the Opposition?” In Rodríguez, Victoria E. and Ward, Peter M. (eds. ), Opposition Government in Mexico. Albuquerque: University of New Mexico Press. Rodríguez, Victoria E., and Ward, Peter M.. 1995. Opposition Government in Mexico. Albuquerque: University of New Mexico Press. Rodríguez, Victoria E., and Ward, Peter M.. 1998. Political Change in Baja California: Democracy in the Making?La Jolla, California: Center for U.S.–Mexican Studies, UCSD. Roggoff, Kenneth. 1990. “Equilibrium Political Budget Cycles.” American Economic Review 80: 21–36. Roggoff, Kenneth, and Sibert, Anne. 1988. “Elections and Macroeconomic Policy Cycles.” Review of Economic Studies 55: 1–16. Rojas, Carlos. 1994. El Programa Nacional de Solidaridad. México: Fondo de Cultura Económica. Romero, Vidal. 2005. “Misaligned Interests and Commitment Problems: A Study of Presidents and Their Parties with Application to the Mexican Presidency and Privatization in Latin America.” Ph.D. dissertation, Stanford University. Ross, Michael. 2001. “Does Oil Hinder Democracy?” World Politics 53(April): 325–61. Rudebeck, Lars. 2003. “Multi-Party Elections in Guinea-Bissau.” In Cowen, Michael and Laakso, Lisa (eds. ), Multiparty Elections in Africa. New York: Palgrave. Rustow, Dankwart A. 1970. “Transitions to Democracy: Towards a Dynamic Model.” Comparative Politics 2: 337–63. Schady, Norbert R. 2000. “The Political Economy of Expenditures by the Peruvian Social Fund (FONCODES), 1991–95.” American Political Science Review 94(2): 289–304. Schedler, Andreas. 2000. “Mexico's Victory: The Democratic Revelation.” Journal of Democracy 11(3): 5–19. Schedler, Andreas. 2002. “Elections without Democracy: The Menu of Manipulation.” Journal of Democracy 13(2): 36–50. Schelling, Thomas. 1980. The Strategy of Conflict. Cambridge, Massachusetts: Harvard University Press. Schmidt, S. W.. 1977. Friends, Followers and Factions: A Reader in Political Clientelism. Berkeley: University of California Press. Schmitter, Philippe. 1974. “Still the Century of Corporatism?” Review of Politics 36: 85–131. Scott, James. 1972. “Patron-Client Politics and Political Change in Southeast Asia.” American Political Science Review 66(1): 91–113. Scott, Robert E. 1959. Mexican Government in Transition. Urbana: University of Illinois Press. Secretaría de Desarrollo Social (México). 1994. Hechos en Solidaridad. CD-ROM. Serrano, Mónica. 1995. “The Armed Branches of the State: Civil–Military Relations in Mexico.” Journal of Latin American Studies 27(2): 423–48. Share, Donald, and Mainwaring, Scott. 1986. “Transitions through Transaction: Democratization in Brazil and Spain.” In Selcher, Wayne (ed. ), Political Liberalization in Brazil: Dilemmas and Future Prospects. Boulder, Colorado: Westview Press. Sheiner, Ethan. 2006. Democracy without Competition in Japan. Cambridge: Cambridge University Press. Smith, Peter H. 1979. Labyrinths of Power: Political Recruitment in Twentieth-Century Mexico. Princeton, New Jersey: Princeton University Press. Stepan, Alfred. 1971. The Military in Politics: Changing Patterns in Brazil. Princeton, New Jersey: Princeton University Press. Stokes, Susan. 1996. “Public Opinion and Market Reforms: The Limits of Economic Voting.” Comparative Political Studies 29: 499–519. Stokes, Susan. 2001. Mandates and Democracy: Neoliberalism by Surprise in Latin America. Cambridge: Cambridge University Press. Stokes, Susan. 2001. Public Support for Market Reforms in New Democracies. Cambridge: Cambridge University Press. Stokes, Susan. 2005. “Perverse Accountability: A Formal Model of Machine Politics with Evidence form Argentina.” American Political Science Review 99(3): 315–25. Stokes, Susan, Valeria Brusco, and Marcelo Nazareno. 2003. “Selective Incentives and Electoral Mobilization: Evidence from Argentina.” Unpublished manuscript, University of Chicago. Taagepera, Rein, and Shugart, Mathew S.. 1989. Seats and Votes. New Haven, Connecticut: Yale University Press. Tilly, Charles. 2004. Contention and Democracy in Europe, 1650–2000. Cambridge: Cambridge University Press. Tsebelis, George. 2002. Veto Players: How Political Institutions Work. Princeton, New Jersey: Princeton University Press. Tufte, Edward R. 1978. Political Control of the Economy. Princeton, New Jersey: Princeton University Press. Walle, Nicolas. 2001. African Economies and the Politics of Permanent Crisis, 1979–1999. Cambridge: Cambridge University Press. Van de Walle, Nicolas. 2001. “Presidentialism and Clientelism in Africa's Emerging Party Systems.” Unpublished manuscript. Van de Walle, Nicholas. (forthcoming) “The Evolution of Political Clientelism in Africa.” In Kitschelt, Herbert and Wilkinson, Steven (eds. ), Patrons, Clients and Policies: Patterns of Democratic Accountability and Competition. Cambridge: Cambridge University Press. Villarreal, Andrés. 1999. “Public Opinion of the Economy and the President among Mexico City Residents: The Salinas Sexenio.” Latin American Research Review 34(2): 132–51. Wantchekon, Leonard. 1999. “On the Nature of First Democratic Elections.” Journal of Conflict Resolution 43(2): 245–58. Wantchekon, Leonard. 2004. “The Paradox of ‘Warlord’ Democracy: A Theoretical Investigation.” American Political Science Review 98(1): 17–33. Wantchekon, Leonard, and Neeman, Zvika. 2002. “A Theory of Post-Civil War Democratization.” Journal of Theoretical Politics 14(October): 439–64. Weingast, Barry. 1997. “The Political Foundations of Democracy and the Rule of Law.” American Political Science Review 91(2): 245–63. Weldon, Jeffrey. 1997. “The Political Sources of Presidencialismo in Mexico.” In Mainwaring, Scott and Shugart, Mathew Soberg (eds. ), Presidentialism and Democracy in Latin America. Cambridge: Cambridge University Press. Weyland, Kurt. 2002. The Politics of Market Reform in Fragile Democracies. Princeton, New Jersey: Princeton University Press. Wintrobe, Ronald. 1998. The Political Economy of Dictatorship. Cambridge: Cambridge University Press. Wood, Elisabeth Jean. 2000. Forging Democracy from Below. Cambridge: Cambridge University Press. Zechmeister, Elizabeth. 2002. “What's Left and Who's Right in Mexican Politics?” Paper presented at the annual meeting of the Midwest Political Science Association, Chicago, Illinois, April 25–28. Zinser, Aguilar. 1994. Vamos a ganar. México: Cal y Arena.